Quilter’s can never seem to have enough gadgets and tools and we’re always looking for new gizmos to make our projects go more smoothly. If you’ve ever done any sewing, you know that you need a good seam ripper. Yes, we do have to “unstitch” something every so often. Last week, my bee had a retreat and one of my bee members brought the rest of us a very neat and pretty seam ripper. It is hand-turned wood with a small seam ripper on one end and a large one on the other end. Or you can purchase one with a stiletto on one end and a seam ripper on the other. 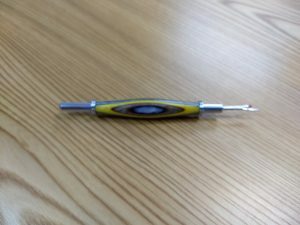 The seam ripper part is very good quality and is nice and sharp. But the best thing about having one of these pretty high quality seam rippers is that it is made by two young brothers who are around ten and twelve. (They are somewhat related to my bee member, but she wasn’t quite sure of their ages.) I’m just impressed that their dad has taught them a skill and they have become quite the little entrepreneurs. They have an Etsy site and they also have some of their seam rippers in a quilt shop. If you’d like to have a seam ripper that is beautifully crafted or would like a gift for your favorite quilter, check out their Etsy site AandJwoodCrafters. They also sell wooden pens and their prices are quite reasonable.